Our team are on hand to discuss your training requirements or to provide further information. Contact us by phone to talk through options today or use our online form to submit your enquiry and we will respond quickly. 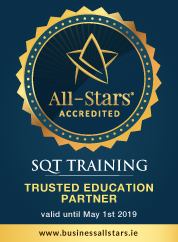 SQT Training Ltd, Registered Office, SQT Training Ltd, Callan Centre, National Technology Park, Limerick, Ireland. Registration No 342029. We hold training programmes at venues in convenient locations around the country. For the latest industry and company news, views and updates.